In the days of the empire, Aztec agriculture was a lot more complex that growing a few stalks of maize. The remarkable farming practices of the peoples in central Mexico has been studied and admired ever since. Prior to the Spanish conquest of Mexico, Aztec society ruled the central Mexico, built on the foundations of Mesoamerica. Aztec society was highly structured and complex, and the political emphasis was working as a larger unit with smaller parts that worked together. Religion played an important part in agricultural life, such as the worship of the corn goddess. Just as other aspects of this society, Aztec agriculture was highly developed, and has become famous in studies of history. From the chinampas to the terrace crops grown, the Aztecs planned and organized their farming and worked for the benefit of the culture. Aztec agriculture in the heart of the empire used chinampas for their crops. Chinampa is a method of farming that used small, rectangular areas to grow crops on the shallow lake beds in the Mexican valley. Chinampas were essentially artificial islands created for the crops. An area was staked out in the lake bed, usually about thirty by two and a half meters. Once the area was fenced off, the farmers layered it with mud, sediment, and decaying vegetation until it was above the level of the lake. Trees were also often planted in the corners to help secure the area. These islands then provided rich soil for crops with easy access to water. The farmers used channels between the islands to get to each area by canoe. Read more about this type of Aztec farming here. In addition to chinampas, the Aztec farmers practiced terracing to provide more usable land. In terracing, walls of stone were created in hillsides, then filled in to create deeper soil that could be used, even if the land wasn't flat. People also often created their own gardens to grow fruits and vegetables for their families, although commoners were expected to give tributes to the nobles of their land, according to the societal hierarchy. 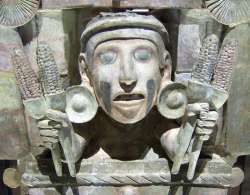 The most common crop grown by the Aztecs was maize, also known as corn, and it was also the most important. Maize could be stored for long periods of time, and in addition to being eaten as it was, it could be ground into flour and made into other foods. Squash was another important crop in Aztec agriculture. There are many varieties of squash that were utilized by Aztec farmers based on how they could be best used as a food source. The pumpkin, for example, was used often because its seeds provided a great deal of protein. And the bottle gourd was grown because after being eaten, it could be used as a water container. Beans are another crop that provided protein for the Aztec people, so this crop was commonly found in chinampas. However, the Aztec farmers also grew avocados, tomatoes, and guavas, among others, as food sources, and used cotton plants and rubber trees to create products they needed like clothing and latex balls. Read more about the food of the Aztec empire here. One challenge all farmers face is retaining nutrients in the soil where crops are planted. Different crops deplete the soil of certain nutrients, so if a specific crop is planted in the same field year after year, it won't grow as well. This is a particular challenge in areas of Mexico where there are large populations and small areas where farming can take place easily. To combat this, Aztec farmers planted crops together or rotated crops to help keep nutrients in the soil, and give them the opportunity to regenerate. Maize, squash, and beans were referred to as the "Three Sisters" in Aztec agriculture. These three crops were planted together because they kept the nutrients in the soil, ensuring the crops would grow well and the people would have the food they needed. Aztec farmers also let the fields sit fallow for a time, meaning that particular plot of land wasn't used for crops to let it rest and regenerate the nutrients it needed. Because of the importance of agriculture to the survival of the Aztec people, the growing of crops was important to all people of the society. As young people grew in society, they could learn agriculture as a trade, which meant the methods were passed to future generations. People also used crops to trade for other products such as animal skins or woodwork. The Aztec society had a strong economy that was driven by trade, so having crops to trade meant the people would be sure to have other products they needed. For a more in-depth discussion of farming in the empire, check the information by William Hickling Prescott. A lot of work has been done on the topic since, but his work still has a lot of good background. Here is his section on Aztec agriculture. Also, be sure to search this site for more on farming and other aspects of Aztec culture.